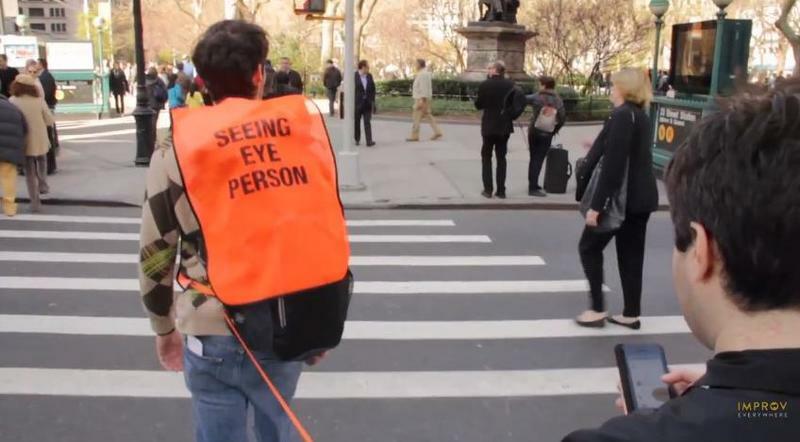 A man in an orange vest with the words "I Can Help You Walk and Text" is strolling down a busy New York street. Another man in a plaid shirt clinging to a leash attached to said vest. Plaid shirt man is busy, phone in hand, texting or looking at websites or tweeting or whatever else it is people do when walking from one place to another. He's being led, with the vested-man ensuring a safe pathway. It's startling—at first—but almost familiar in a way. Like, oh, I could see this actually becoming a real thing. Sadly, in today's smartphone-obsessed world, this imagined public service is the kind of progress we as humans are headed towards. Because we can't simply walk, eyes forward, coffee grasped tight. We have to be connected, eyes locked on screen, through tiny pocket computers, unconcerned with possible hazards of city sidewalks. Or, for that matter, mall fountains. This video isn't a real thing, and in fact it's meant as a big joke. But how long before something like this is taken seriously, and the Wall Street suits are requesting an Uber for texting? Probably not long, thanks to ImprovEverywhere's video. Or maybe Google Glass will change all that once it becomes available to the public.